Beach style grilled corn needs no introduction as it is one such yummy and healthy snack that we all have relished since childhood. 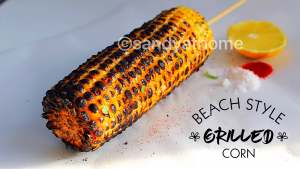 Beach (Marina beach) reminds us of many things and one among them is this grilled corn with the charred flavors. 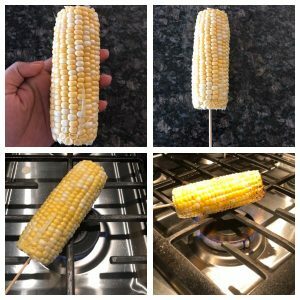 It is super easy to make at home and requires no expert techniques to achieve the real taste.But you need to be your own judge as sometimes the inside part wont be cooked and only exterior gets coloring to avoid this scenario keep moving the corn every 20 seconds and grill it on medium flame only. The cook time can vary according to burner size too. So next time you see corn in store try out this version and will surely feel nostalgic. So lets get to the making! Peel the husks and silk from corn. 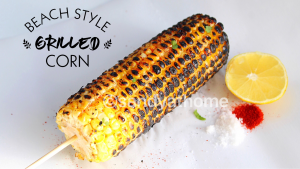 Place the corn on the grill/ gas stove (burner) at medium to high heat. Slowly flip it every now and then for even roasting. 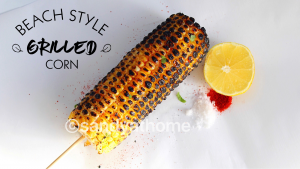 When the corn is being roasted/ grilled you will hear popping sound of kernels which is normal. Keep roasting till you achieve preferred amount of roasting. If you like it charred more roast it for longer time. When done remove from fire and sprinkle required amount of salt, chilli powder and squeeze in some lemon juice and relish it hot! Peel the husks and silk from corn. 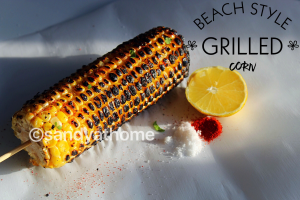 (If you really want that exact beach corn style just pull the husks back and grill it) In my case I all he husks and silk was removed and only the corn was sold in box here. 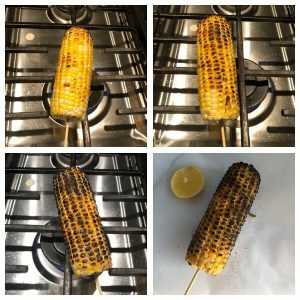 So i gently inserted skewer in one end of the corn to make it easy for grilling.